Choose small sea bass so you can serve one per person or, if only larger ones are available, ask the fishmonger to fillet them for you. When cooking fillets, you'll need to reduce the cooking time slightly. Alternatively, try sea bream or cod. Preheat the oven to 200°C, gas mark 6. With a sharp knife, score the sea bass several times on each side and remove the side fins. Pack half the chopped thyme and parsley into the cavities and season all over. Heat 3 tablespoons of the oil in a large frying pan. Add the onion and sugar, and fry very gently for 10 minutes, stirring frequently, or until it starts to caramelise. Divide the onion between 2 large, shallow ovenproof dishes or roasting tins and spread in a thin layer. Arrange the fish side by side on top. Brush the heads and tails with a little oil. Drain the anchovies, reserving the oil, and chop as finely as possible. Mix with the garlic, anchovy oil, remaining olive oil and plenty of freshly ground black pepper. Drizzle the dressing over and around the fish. Cover the heads of the fish with foil. Bake on 2 oven shelves for 20-25 minutes, swapping over the tins halfway through. To test the fish is cooked, pierce the thickest area of one fish with the tip of a knife. It should be opaque and flake easily. Scatter with the remaining chopped parsley and thyme, and serve straight away. 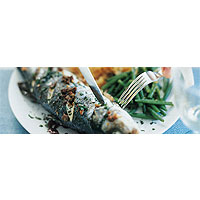 A dry, zesty white will work well with the sea bass and complement the caramelised onions.